Groups are a way of tracking subsets of your supporters who meet certain criteria that set them apart from the rest of the list. These groups can be used as search criteria for queries and for targeting email messages. Salsa allows you to create as many groups as you like, and each group can contain as many of your supporters as you would like to include. Groups can be used as search criteria for queries and for targeting email messages. First, click on the Supporter Management tab. One of the links that appears under the tabs will be Manage Groups--click on this to be taken to the groups management page. In the lower left hand corner of the groups page, there is a blank field labeled New Group Name. (If you already have a lot of groups set up in Salsa, you may need to scroll down to find this field.) Enter a name for your new group and click the button labeled Create New Group. The page will refresh, and your new group will appear in the list of groups. The members tab displays the supporters who are members of this group. You will see the First Name, Last Name, and email address of each group member. By default, the list of members is sorted by the creation date for each supporter record--you can change the sorting criteria by clicking the Sort by drop-down menu on the right hand side of the screen. If there are too many members to display in the area, members will be sorted into multiple pages. Underneath the list of members you will see links to navigate through the pages. You will also see information on the total number of members of this group. You can quickly add new individual members to the group by entering a supporter's email address in the text field labeled Add supporter by email address and clicking the Add to Group button. If that email address already exists in your system, that person will be added to the group. If you add an email address that does not match up with an existing supporter, the system will create a new supporter record with that email address. This tab will allow you to change the name of the group, or create a parent/child or group/subgroup relationship with another group. Be sure to hit the Save button each time you make modifications to a group's settings! Group Name - Change the name of the group by simply typing a new name in the group. No other changes will need to be made. Choose Item Parent - This feature allows you to create parent/child and group/subgroup relationships. To designate a group as a child (or sub) group, click the Choose Item Parent dropdown and then select an existing group from the list: the current group will become a child/sub to the group you select. Note: The parent-child group relationship in Salsa is just for your visual and organizational reference. The members of a child group are not automatically members of the parent group. They're two completely separate groups that just happen to look like one "contains" the other. In other words, if you query or target a parent group, you only target the people in the parent group itself, not the child groups. (In our example above, targeting the 2012 Community Teams group won't target the various team groups.) If you want the parent group to contain all the members of its child groups, configure the parent as a Smartgroup with a query that adds all members of the child groups. Description - This is an optional field for a short description of the group. Please Note: This description is also displayed on unsubscribe pages, if the group is public, so use discretion when adding text here. Use the Notes field (coming up next) for internal information. Notes - This is an optional field to store your notes about this group. This text is only visible internally in Salsa, so if you want to say something unflattering or confidential about a group, this is the place to do it. Display to user - If you check this box, the name of this group will appear on unsubscribe and supporter profile pages so that your supporters can opt in or out of this group. Leave this box unchecked if you do not want your supporters to be able to add or remove themselves from this group. Salsa allows you to create email lists which can be used to create more space for your supporters to interact with you and with each other. A listserve in Salsa is a means of allowing the members of a Group to communicate with each other. They can be open, moderated, or allow only specific members to post to them. The many options available for configuring your listserves are described here. Listserves are set up through the Manage Groups section under Supporter Management. Any Group may be used as a listserve. When you name your group, you'll want to keep your group name simple and avoid any "special" characters that wouldn't normally be found in an email address. All members of your group will be sent listserve messages unless their Supporter record has an Unsubscribed receive email status. If you're just getting started, we highly recommend creating a test group with a few different email addresses that you can use to make sure your Listserve suits your needs. If you run into any trouble at all, please email support and let us know the internal URL or group_key for the group with which you're working as well as any particular error messages that you're encountering. For the purposes of Listserves, once you give your group a name, you'll use the Listserve and Options tabs in the group interface to set up your Listserve preferences, and the Recent Listserve Messages tab will be helpful for monitoring what has been sent. Open Discussion List: If the list is marked as Open, all members of the group may post and receive messages through the listserve immediately. Open Discussion Lists may not have any moderators listed in “Moderator Emails." Moderated List: If a list is moderated, you'll want to add at least one email address for the moderator of the list through the Moderator Emails field. The moderator must also belong to the group. Restrict Posts to Allowed Users: If this option is selected, all members of the group will have a menu in their corresponding supporter record under the Groups/Interests tab that will allow you to specify what sort of access they have to the listserve. Moderator Emails: If entering numerous moderator emails, you'll want to delimit your list with commas. Moderators will be notified via email when a message needs to be moderated. There are two ways to moderate: Moderators can reply to the email message they receive, or they can view the message through the groups interface in Salsa by going to the Recent Listserve Messages tab, clicking the “ID” link for the message, and changing its Status from "Pending" to "Moderated". Once it has finished processing, the message will be marked as "Complete." Subject Prefix: You may choose to have something like "[Community Listserve]" prepended to the subject lines of emails sent through your listserve. Append Header: Headers can be automatically appended to emails sent through the listserve. You do not need to use this field. Append Footer: This is a good place to add a note about unsubscribing from the listserve, but you do not need to use this field, either. Listserve Email Address: This is the email address to which your listserve messages are sent. Listserve Options: This field can be ignored. Aliases: You can set up an alias so that you can send messages to your listserve through a simpler address that is relevant to your organization. Please see “Creating an Alias” below. Edit Aliases: Click here to edit your aliases. More details on creating aliases are below. After you save this information, the email address for posting to this group will appear at the bottom of the Listserve tab. It is usually something like: MyGroup+12345-org@lists.democracyinaction.org, though the domain will change depending on what node your account can be found. This email address will work to send messages to that listserve, which will then be distributed to all members. The standard listserve domains for Salsa look something like @lists.salsalabs.com. Creating an alias for what comes before this domain is quite easy. For each of the listserve groups, copy the default listserve address referenced at the bottom of the listserve tab, then click on the "Edit Alias" link. You'll redirect to a new page where you can use the Add Alias button to add another row on the Alias list. Paste the full default listserve email address into the Real Address field, and type the desired Alias address into the Alias. (As an example, XXXX_Group_Listerve@lists.salsalabs.com would be the default listserve email address, and GroupName@lists.salsalabs.com would be the alias). Then, for each of the listserve groups, copy the full default listserve address referenced at the bottom of the listserve tab, then click on the "Edit Alias" link. You'll redirect to a new page where you can use the Add Alias button to add another row on the Alias list. Paste the default listserve email address into the Real Address field, and type the desired Alias address into the Alias. (As an example, XXXX_Group_Listerve@lists.democracyinaction.org would be the default listserve email address, and GroupName@list.yourdomain.org would be the alias). Set the alias to Active, hit save and you should be all set up from your end. For the very last step with your custom domain, let us know when this has been done by emailing support@salsalabs.com. We'll need to report this to our systems team and make some changes with configuration on our end. Last Modified: This is the date that the group settings were last changed. Date Created: This is the date on which the group was initially created. Reference Name: For internal purposes, only. Does not need to be populated. Subscription Type: This field can be ignored. Manager: This field can be ignored. Listserve Responses: Changing this setting will change from whom the messages appear to be sent when viewed in the recipient's inbox. From Sender: Messages will appear to come from whomever submits the listserve message, so when a member of a listserve group sends a message to the group, replies to that message go only to that member. From Email: You can choose to have your emails appear with a distinct "From" email address. From Name: You can choose to have your listserve emails appear with a distinct "From" name, such as "Community listserve." Reply to: You can choose to have your listserves default to a particular "Reply to" address. Setting this field to a single email address can be particularly helpful to avoid the sending of "out of office" and other types of autoreplies to the entire list. To send a Listserve message, you'll use your personal email client to craft your message, then send that message to your listserve address or alias. Click on the "Send Message" link next to the listserve email or Alias email at the bottom of your Listserve tab. This will open a new window for composing an email from your computer's default email client. As long as you're sending to a valid listserve address from a valid email address that is included in the groups list, you should be able to submit the message without error. Please note: We do advise that Salsa listserve messages be in plain text only for more efficient processing and increased likelihood of the messages making it to their respective inboxes. We do not recommend sending attachments via Listserve messages. The increased size of the email causes issues with many spam filters. If you run into any issues, please email support and include reference to any error messages that you may have received. This tab will show all messages sent. If you are testing sending your listserve messages but they do not show up in this list, there's likely an issue with the message that is prohibiting it from getting to our servers in the first place. Doublecheck that you're sending your message from an email address that is in your group, that you're approved to send messages, and that your message content is relatively straightforward, since very large attachments can cause the message to not send properly. Date Submitted: This is the date your listserve message was submitted for sending. Rejected – if for some reason your message could not be sent (common reasons include attachments, images, or MS Word code in the message body), its status will be Rejected. Moderated – this is the status of a Moderated listserve message that has been approved by a moderator. Sending Emails – the message will have this status if the listserve message is in the process of being sent to all the members of the group. Complete – this status will appear once the message has been sent to all the group members. Failed - the mail server was unable to send your message (possibly due to a server issue). Result: Displays the number of messages sent successfully and the number of errors. Supporters can be added to the group either directly through the Salsa interface or through the "Add to groups" functionality on a sign up page or another online form. Salsa's unsubscribe pages can also allow for unsubscribing from specific groups (as opposed to completely unsubscribing from your overall supporter list). Checking the Display to User option in your groups set-up will allow for the particular group to appear on the default Unsubscribe and Profile Manager pages. If you have a specific group that will be using your listserve, say board members, then you probably won't need to promote. But, if you're opening a general-interest public listserve to get supporters talking about the issues, you'll want to have a sign up page for the listserve. Select which info fields you'd like to get from your supporters. Remember, sometimes less is more. Write a few sentences explaining for what your supporters are signing up. Select the group which you converted into a listserve from the groups dropdown. You can either choose to add people automatically to the listserve or have a check box where they select themselves. The latter option is great when you have more than one listserve to join; for the former, make sure that the page adequately describes to the user the fact that s/he will be joining the relevant listserve. Groups, by default, don't add or subtract their membership except through somebody's manual intervention, either by a campaign manager (you) adding, deleting or importing supporters, or by supporters themselves opting-in or unsubscribing from groups. If you find yourself running the same kinds of queries over and over to add people to groups, why not make the group a smart group and automate the process? A Smart Group's membership is automatically updated once a day (every 24 hours) according to criteria you specify in advance. To create a smart group, build and save a named query. Then, select the group and under the "Smart Group Options" tab, check the "smart group" box, select the appropriate query, and save. (You need to have the query defined before you get to this screen.) Smart Groups are also useful when working with data that takes more time to compile, such as action history or email statistics. Still in the same tab, associate the Smart Group with a saved Query . Tip: Smart groups can be a handy tool for giving local organizers access to a dynamically updating roster of people in just their region. Just create a role limiting that user to the membership of a smart group, then have the smart group run a query such as a single state or a postal code radius. Presto--no more emails saying "Hey, could you export me another list of all the people in my district?" Rather than making a really complicated smart group that covers every possible supporter in a manager's district, though, keep the smart groups simple, then add child groups with manually added supporters that might not match the query. Read more about smart groups. A regular smart group will automatically empty itself once every 24 hours, then repopulate itself with your saved query. "Greedy" smart groups are just like smart groups -- except they only add supporters, never emptying themselves. 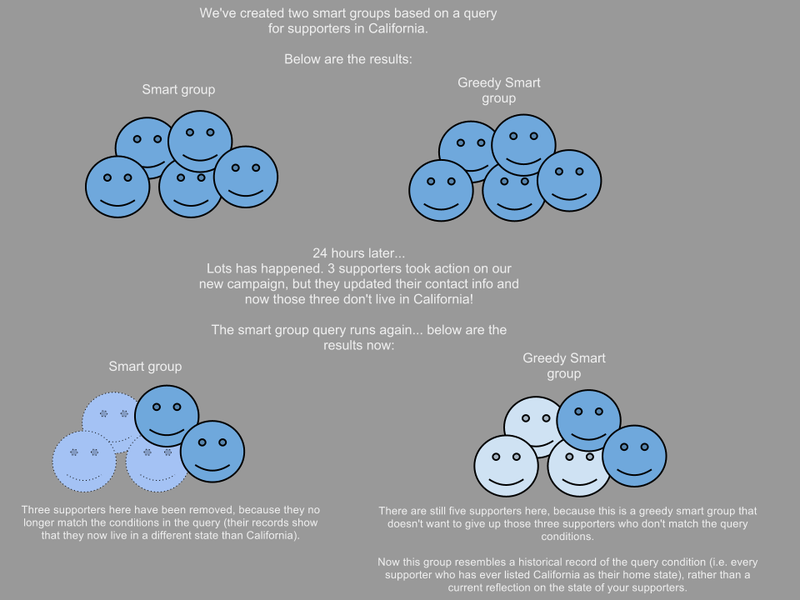 A smart vs. greedy smart group example: Say that you're constantly importing supporters to your database, and you want use smart groups to automatically add everyone from Hawaii to a group. A standard smart group (set to use a query that finds every supporter who lives in Hawaii) will add everyone in your database who lives in Hawaii to the group. However, suppose a supporter moves from Hawaii to Alaska, and her supporter record is updated accordingly. A smart group would remove her from your Hawaii group, the group empties itself and then adds people who live in Hawaii--since her record changed, she wouldn't be re-added at the next update. A "greedy" smart group will greedily hold on to this supporter and any others who leave Hawaii, and only adds new members instead of removing those that no longer match your query. This might be helpful, for example, if you want to give people the option to continue in a group that follows a local issue even if they move away from an area. If you're not sure or just starting out with smart groups, we recommend sticking with regular, non-greedy smart groups. You generally need a good reason for keeping people in a group who don't match the group criteria, and you can get stale or incorrect data if you're not careful. Tip: Greedy smart groups can send autotriggers emails when new members are added. So if you want to make sure that people in a certain group always receive a welcome message, it's easy set that up. Read more about setting up autotriggers with smart groups. What's the difference between groups and tags? But don't be afraid to use both! 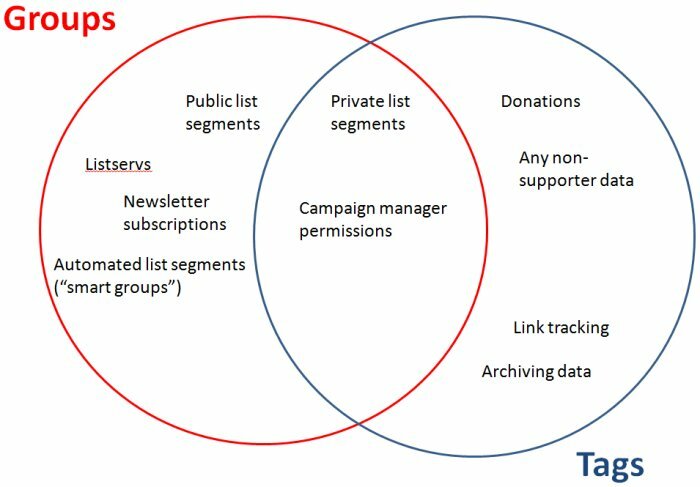 Groups and tags are similar in many ways to one another--groups collect subsets of supporters (and only supporters), while tags can attach to any object in Salsa (including supporters, but also including donations, donation pages, actions, or all of those together). Since you can use groups and tags as different data points, make the most of them.Check out this blog post about using groups and tags to add granularity to your data landscape. You'll find these under the 'Options' tab of the Group's setup. This is an advanced feature that most organizations won't need to use. Group join triggers should be processed when the supporter is added to the group via a Salsa form or API. For Smart Groups this would happen when the smart group query processes over night. This is useful information. I'm doing zip code smart groups right now so we can keep an accurate count of how many people we have per each zip code. However we cover a lot of turf so I wish the user interface didn't require that I create the groups, query then go back to make it a smart group. It is a bit tedious. Is there a better, more efficient way? GREAT question, and one I'm happy to help you with. We can cut one step out of that process. Here's what you'll do. You'll still want to create the group that you will convert to a smart group. Run the query, and on the query results screen, find the option in Group Operations to 'Make this query the basis of a smart group'. Select the group from Step 1, click Add/Change and you're set. After that, you can go back to the group information page to double-check that it's all set, but... that would defeat the purpose of eliminating a step. ;) Just remember that the smart group queries only run once a day, so you may have to wait until the next day before you see any members populating the group. Hi Carrie! Sorry this was confusing. We have several different nodes of Salsa clients, so each node has its own standard domain, but I just updated our documentation so that we're at least referencing the same example standard domain throughout. Yes, you are correct - When using the standard domains, you can still customize the first part of the email address, but when you enter this address in the Alias rows, you'll want to type out the entire email address. The standard domain is exactly the same as the original listserve domain. The custom domains part of things is a little more complicated, since you will have to make some changes through your DNS to set up the alias, but if you do need additional assistance for any reason, please don't hesitate to email us at support@salsalabs.com and we can give you more specific details based on what you're working on. Thank you! I am trying to do some group clean up--some of our groups are not up to date. Is there anyway to organize the supporters in the group by date last modified? I need to know when the last time someone used, or modified the group, or supporters in it. Organizing by date created is somewhat helpful, but organizing by date modified would be ideal. Definitely, but we're going to have to jump into a custom report. Don't forget to hit Save on each tab before moving on! First steps are pretty easy, just make sure to choose the "Aggregate report" option. Make sure to choose the "Groups" option from the classic object chooser. Click add column to select data columns. First add Group Name (found in Groups Fields) and make sure the "Group By" check box is set. Then add both Last Modified from Supporter groups Fields and from Groups Fields. One tells you when the group was modified last, the other tells you the last time someone joined the group. Give them labels as well so you can tell them apart. Skip to the Sort by_ _column and decide which field you want to sort by. With the date fields, "descending" will list the most recent changes first. With the group name field, "ascending" will list the groups alphabetically. Then click Save and then Run Report. Quick question: I want to create a new group, and I have approximately 500 people to add to the group - what is the quickest way to create this group? Can I somehow import my list of group members rather than add one by one? Yes, Alex. From my recent experience, you have to create the group first, but don't add anybody to it. Exit the group function. Then go to Supporters and import your supporter list (or create a query to pull out the 500 supporters out of your existing supporters). As you're importing the list (or creating a query to find them), choose the option to add everyone to the group you had created. This is a quick overview of what to do. Let me know if you need more exact step-by-step instructions. What settings should I use so that group members can reply to everyone in the group in response to a posted email? Is there a way for group members to view all the previous messages? Hi there. I was actually on the reports page and was looking for " Guide to the Report Builder" and when i clicked, I ended up on this page which is not really what i was looking for at all. Is this the correct page? If so, is there a different page with information pertaining to reports? Thanks! I was also looking for the "Guide to the Report Builder." What I'm finding in the Commons has not been helpful. Yes! I'd love to find any documentation for everything we do in Salsa. It seems like a useful platform to this new user, but I'd like to have an operating manual where step-by-step information is available in one place so I can follow it. It may exist somewhere, but I haven't found it yet and no one's revealed one to me in several calls to tech support. Trying to sift through Commons is time-consuming. It looks like a few people are looking for " Build a Custom Report" documentation. Here you go! Is there a way to import members into a specific group? Yes, you an import members into a specific group. If it's just one group, you can create the group ahead of time, add a column to your import spreadsheet, and for each supporter record enter a value of 1 if they belong in that group (leave it blank if they don't). There's some more information about this in the import documentation. b. Browse to the .csv file in your computer’s “Downloads” folder. c. If you’ve done a similar upload, choose one (this can save you time because it will pre-match the fields for you). d. Click “Save + Continue” button. e. Make sure the fields are matched correctly. f. Choose the Group that you are adding this list of people to. g. Do not add a tag (unless you plan to use tags in the future!). j. Do not check any of the Overwrite options. •Because we want to only add data into previously empty fields. But, you’d check this box only if you want to overwrite *everything* that’s currently in each supporter’s existing record. This isn’t recommended unless you know FOR SURE that the data already living in Salsa is 100% old or 100% inaccurate and that you want to start clean. k. Click “Submit for Upload.” You will be taken to the View Import Status page. Refresh this page until your import’s status is “complete.” You can determine success by looking at the counts. l. Repeat steps a-k to add them to the other lists (“groups”). You will not be creating duplicate records for them, just adding them to more groups. It's true - another option is to upload the file and to select the group you'd like to add users to on "Step 2" of the import as shown below. This will work if all supporters you're importing should be added to one group. If you'd like to add some supporters to multiple groups, see the instructions above. Hi! Is there a way for listserv members to control how they receive messages, i.e. in a daily or weekly digest? Unfortunately, that feature is not currently available in Salsa. The request has been added to a list of feature requests for future consideration. I created a group and imported the wrong people into it. Is there a way to remove the group and all the supporters in it? You can easily delete a group. Just go to the supporter package, click on Manage Groups, and select the incorrectly created group. From there, you can click on the dele group text link under the group's title. You'll get an "are you sure you really want to do this" message, so click OK there. Doing this will delete the group, but the supporter records will remain in your database (they'll just no longer be in the deleted group). Is there a way to use parent groups to populate a query of all the sub-groups? I tried just selecting the parent group in the query, but that didn't seem to work. I am hoping I can use a parent group as a smart group to gather all the folks in the subgroups together. Or is that what tags are for? I just noodled with the query function, looking to define which supporters acted a certain way upon receipt of an eblast. I created a query, then accidentally added the names from that query to CAPA's Annual Dinner 2011. How do I undo adding these 1164 people from that history? Thanks for any help anyone can offer. Is there a way to create/export a list of everyone who open a certain blast, for example, specifically with their phone numbers displayed? Joan - If you want a parent group to populate a child group, you can make the child group a smart group, and make the query for that smart group = is member of parent group. If you accidentally added a query full of supporters to a group, you can also batch remove them from the same group. On the Take Actions tab of a query, the section option under Group Actions is "Delete from a group." You can build a query to find a list of members who responded to a particular email blast. In the query tool, select Email Status, the email blast in question, and then the status you'd like from the options below. From there, you can use the Export functionality at the bottom of the Take Action tab to export a list of Supporters who meet these criteria to Excel. Is there a way to add a tag to all members of a group after they've been imported into Salsa? You can easily do this via the query tool. On the Take Action tab, you can bulk tag all supporters in your query results with the same tag. Simply pick the tag you want from the drop down list and click the Tag button. All Supporters which are in the selected group, now have the identified tag. Done! I am a little confused and I hope I can get some help/answers. I just saw that a supporter that made their first donation today, and respectively their supporter record was created today was pulled into a group. So, the particular supporter is now in two groups that are "Not Smart Groups" and should not be automatically pulling records into them. Is there a way I can prevent that from happening, and is there a way for me knowing it's happening without having to go under the Groups & Interests tab?